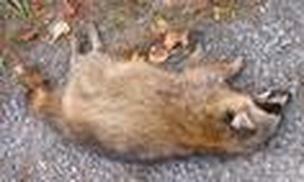 When you have a dead animal in Milwaukie and need to have it removed we are able to pickup the dead animal, sanitize the area, and deodorize your house. Dealing with a dead animal problem in your house is never a fun thing and only gets worse the longer it is put off. We always recommend getting the problem solved properly as soon as you notice you have a problem. There many risks involved when you have a dead animal in your or under your house. The obvious health risk that can spread to humans, pets, and other wild animals along with odor damage is the problem is there too long. The best thing you can do is to prevent this problem from happening. You can do this by making sure your house is properly sealed, but if you do not know what you are doing this can backfire. If you have an obvious opening underneath your house leading into the crawl space, then most likely animals are probably using it. Many times domestic cats will use the same houses as raccoon's or opossum's. So you need to make sure no animals are inside when you seal it up. If you are not sure we are able to come out and confirm no animals are under before sealing up your house. Milwaukie Dead Animal Removal Call 503-201-2432!